This colourful floor puzzle comes with 26 large, simple fit-together shapes, including 9 animal shapes, for children aged 1+. The finished puzzle size is 66cm x 66cm and the Bible story is told on the back of the box. 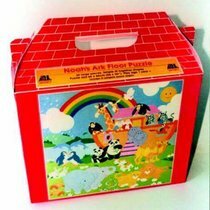 About "Floor Puzzle: Noah's Ark"
This floor puzzle for children to assemble, has 26 large, simple fit-together pieces, including 9 complete animal shapes, in its own carry box. It shows the full picture on the back along with the Bible story and scripture reference.